At last! I have got myself an instrument. At the price I paid, ($NZ 42) it will do me for a while, and then I plan to upgrade. I got it from Lewis Eady in Remuera. They gave me a 10% discount, because I am a student. This little yellow ukulele will be my go-everywhere instrument. My 2 year old enjoys sitting on my knee and stumming it with me, so he can inherit it from me later for his own use. 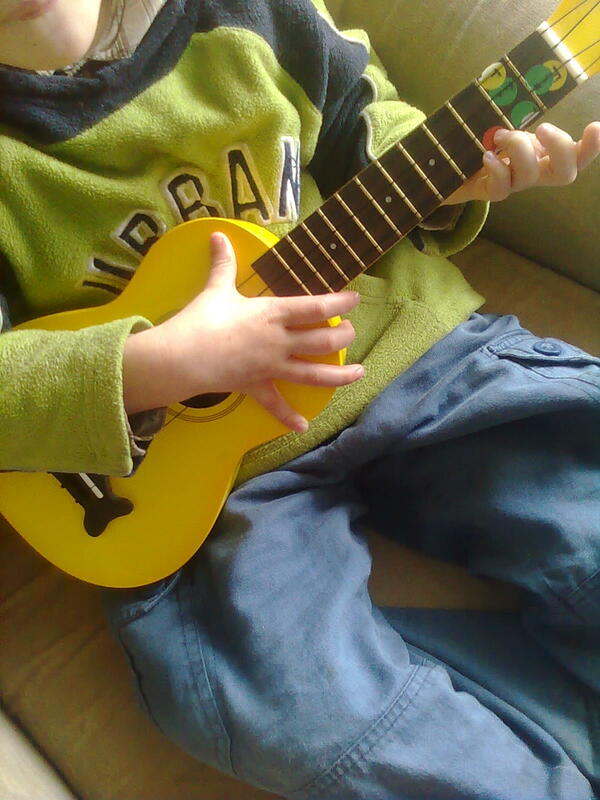 The uke spent the afternoon last week being passed around and inspected by the family – just like a new baby. When it was time for me to feed the real baby (our 5 month old), I strummed her tummy and made her laugh. OK, I’ve copied this from the notice I sent out to my local Home School Support Group / Home Education Groups. Do you love music, and singing, but its too difficult to learn, or too expensive? Would you be interested in joining a ukulele group with other homeschoolers? I am starting a new project soon, a homeschool ukulele orchestra! Maybe the name will be Home Edukuleles! Can you think of a better name? Ukuleles are way cheap! (approx $45 for a reasonably good beginner’s instrument). So if you try it and don’t like it, not much money lost (or you could give your uke to someone else you know who likes to sing). Because it is way easy. Even Mum and Dad can learn 2 chords in 2 minutes. It is heaps of fun. Everyone can bang a tambourine, pot, frying pan, clap or stomp along. The uke is an instrument which puts a smile on your face. You can play, you can sing, you can do it quickly. What’s not to love! The best thing for us, is that we can all play together, and sing along. It doesn’t take years of practise. My dream is that every homeschool family in NZ will have one uke player. Discover your God-given musicality. Bless your family and use music as a great way to spread the Gospel of the Kingdom. Music is powerful for good, and lets use it. Now, I’ve saved the best till last. I am going to look for funding from Charitable Trusts, The Auckland Council. CreativeNZ, where ever I can find it. We may be able to have ukuleles donated for those families who cannot afford to buy one. So, if you’ve always dreamed of playing the guitar (perhaps you have a dusty one sitting in your wardrobe like me), and it was just too hard to get started & keep going – join us! Send me an email or phone me, and then I will have numbers to put into a funding application. Here’s my poem. I’ll turn it into a song one day. I’ve written it because this week it was World Alzheimer’s Day. I’ve forgotten which day of the week it was (normal memory loss). And the sunshine of Glory is coming. Today I was full of lots of strong feelings, and I had to get some down on paper. There’s lots of significant things going on in the family right now. And I had to deal with it. So, I wrote a poem. Its a really bad poem, and I don’t like poetry. I don’t like reading poetry, or writing it. But this was a way for me to deal with my feelings, and feel like I could reach out to a hurting person I love. So I will turn all this into a healing song for us. Last night I went to sleep with music and ukes on my mind. I’ve finally found the instrument for me. My children think I’m a quitter because I’ve tried and given up on piano (6 years), violin, viola, cello, clarinet. And guitar. I liked them all in their different ways, but deep down I realise now that I wanted something to sing along to. I’m a wee songbird, waiting to fly out of her cage. So, the guitar which has been sadly neglected will be tuned up again. The strings are still good. And my string players who already have callouses can help themselves. I will take the easy -in instrument. I’m looking forward to singing along to the uke, with my 2 chords, and not such sore fingers to start with. I love the steel strings on my guitar, but I hated that I couldn’t play for more than 10 mins to start with. By this time next year, I’ll have some callouses, built up gradually, and lots of singing along the way. My right wrist is loose and ready to go strummin. Kalo are the best value for money. Solid body ukes sound the best. Not plywood. Not MDF. (Yeah, I know). Mahogany isn’t the best, but its not the worst either. I’ll reserve judgement on that one. I’m not much closer to buying an instrument. Maybe I’ll bring some in from overseas. Lots of research. (No, I didn’t go music shop crawling all in one day). Dark shop. Hard to get a good look at the instruments, they are covered with “don’t touch” signs, and the better instruments are locked up in a cabinet. Sad but true. This is Deep South Auckland. No one in the shop plays the uke. One or two of the 6 or 8 string ukes had strings which were looking a bit tired. We bought a music stand, and 2 picks. Staff tried to track down a “spider” capo for me, unsuccessfully. Next! Super friendly and helpful shop owner. A really feel good shop. Owner can play the uke, and showed us some chords. Lots of cheap ukes for sale, but nothing that really appealed. I bought some wee maracas / egg shakers for our 2 year old because I liked the owner so much. Also a Baritone Uke Method Book. I’ll tell you why later. Next! The Rock Shop, Sylvia Park. Good place. The salesman knows how to be helpful without being pushy. He also can play the uke. A bit. A better range of medium quality instruments, in various sizes. I bought a uke method book, with CD which has a lot of songs I like. They have some cheap ukes made from MDF. Yikes, run a mile. I did also buy a capo for my accoustic/electric guitar at home. Soon to be dusted off and revived as a baritone uke. Store Manager John gave me the best advice about lower priced ukes – the plastic ones are better in the long run because they last. Anything else won’t stand up to wear and tear from being played by chil. They have a small range of medium priced instruments. The cheap ones are by the door, the nicer ones are around the corner, hiding among the guitars. I didn’t see any accoustic electric ukes. Maybe one, a bass uke, high up. I like Lewis Eady – they have very good prices for sheet music, but they don’t carry a big range – we usually have to order stuff in. Another dark shop. Another Super helpful salesman. They have a good selection of medium range instruments, and some electric accoustic ukes. I think I’ll be back, mainly because they have a good range of sizes. I like KBB because they sponsor the best secondary schools music festival in Auckland, and also the Double Reed Society. No uke players here either. I bought a really cool little book by a NZ author “Now I Love Music Practice” by Ron Ottley. This book does exactly what it promises, with a beautiful selection of stories and ideas. “This book will encourage, support and inspire all music pupils”. 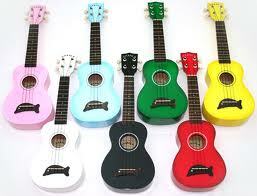 A range of medium ukes here also, but I’m suffering from indecision now. Piano Traders is great for sheet music, they usually have what you want, but you pay for the convenience. Oh man, the coolest shop. No ukes that we wanted (2 second hand ones only). But the experience of going in there was amazing. Its beautiful. Full of amazing guitars and the most friendliest nice owner. Bad alliteration, I know. We bought a leather neck strap for a child’s uke. $30 made in Nelson. The Fiddle Shop, Dominion Rd. Last, but not least. The shop with the most beautiful ukes in the world. And the only place where the uke is played how a uke should be played. Have a look at the beautiful ukes made from Hawaiian hardwood, and inlaid with paua. They sell them on eBay in the USA. Sadly, by this time I had decided that we wanted a tenor sized uke for our son, and all they had was a Soprano in our price range. They plugged one in for us to try and were very patient with our son, who was trying it out. Besides, by now I am really unsure about what to get. Need time to think. So we buy a 3/4 violin bow, a shoulder rest for a violin and an electric pick up for putting on a violin or viola at home. Our salesman was a Luthier, who kindly gave useful advice about rosin, bows and shoulder rests. Next task: make a spreadsheet with all the information I have collected about instruments. Our family is getting started on learning the ukulele. I’ll share our journey with you. We are a home educating family of 11 (Father O’Brian, the Mother Superior, + 9 Talmidim), and we live in New Zealand. Life has been pretty full recently, but there’s always room for music. Our Talmidim (Hebrew for students/disciples) need something fun, cheap and easy to learn. Oh, and something that you can sing along with. Oh, and something that won’t make the dog next door howl (that rules out recorders, then). First of all, we need a uke or two . . . or more.